Biomedical applications have benefited greatly from the increasing interest and research into semiconducting silicon nanowires. 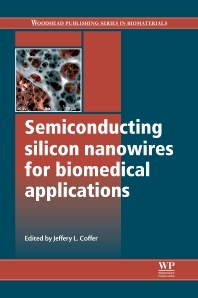 Semiconducting Silicon Nanowires for Biomedical Applications reviews the fabrication, properties, and applications of this emerging material. The book begins by reviewing the basics, as well as the growth, characterization, biocompatibility, and surface modification, of semiconducting silicon nanowires. It goes on to focus on silicon nanowires for tissue engineering and delivery applications, including cellular binding and internalization, orthopedic tissue scaffolds, mediated differentiation of stem cells, and silicon nanoneedles for drug delivery. Finally, it highlights the use of silicon nanowires for detection and sensing. These chapters explore the fabrication and use of semiconducting silicon nanowire arrays for high-throughput screening in the biosciences, neural cell pinning on surfaces, and probe-free platforms for biosensing. Semiconducting Silicon Nanowires for Biomedical Applications is a comprehensive resource for biomaterials scientists who are focused on biosensors, drug delivery, and tissue engineering, and researchers and developers in industry and academia who are concerned with nanoscale biomaterials, in particular electronically-responsive biomaterials.